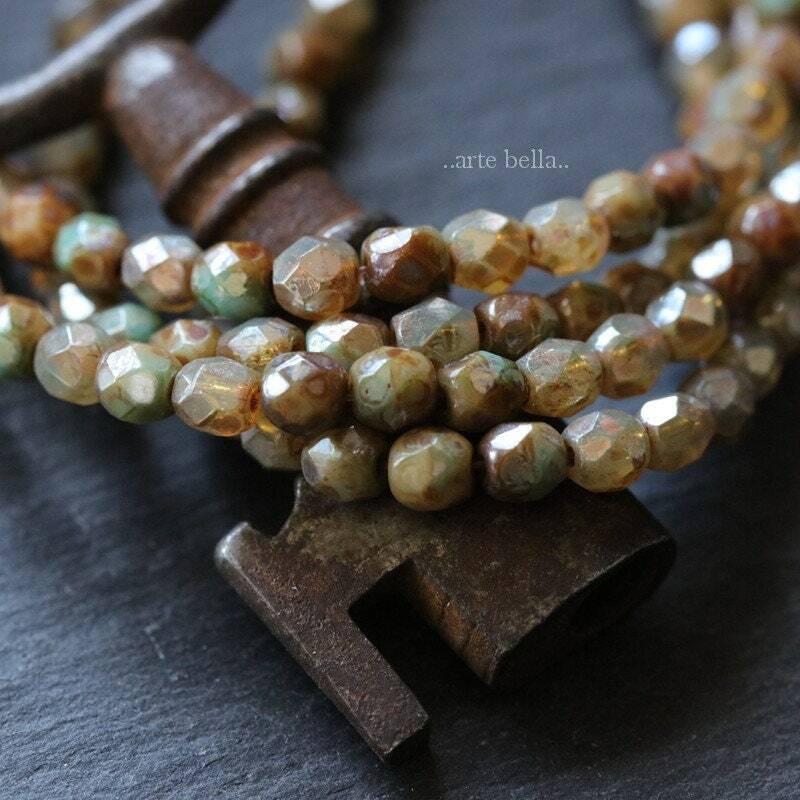 Another beautiful bead in my "Cashmere" series. 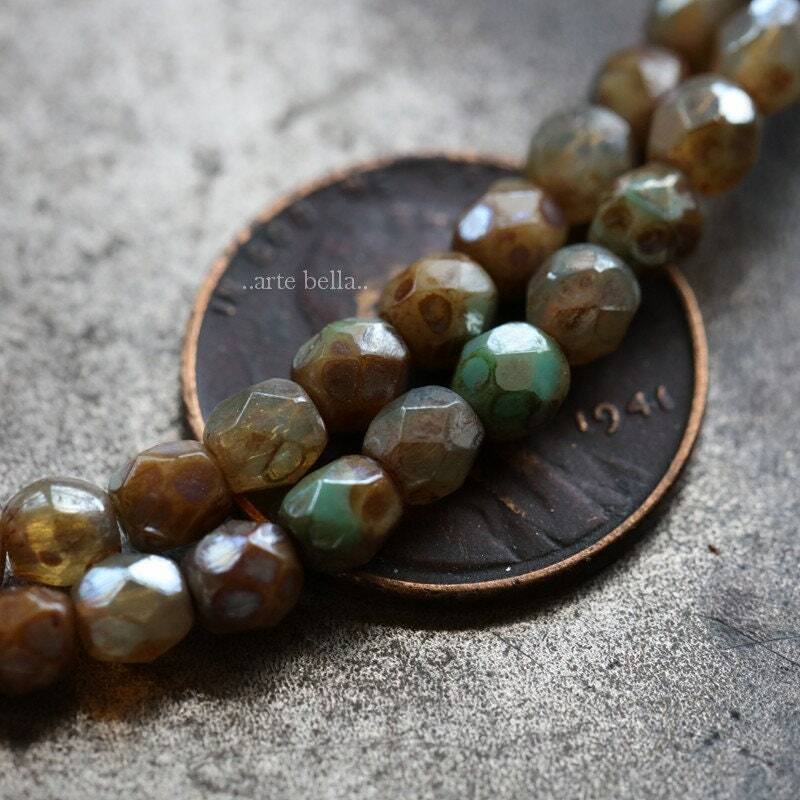 A random mix of golden creamy milky opal glowing glass and turquoise green brown mix with a gorgeous earthy metallic Picasso finish, simply stunning!! Love these, super versatile! All images and text are property of Arte Bella © 2006 and beyond. ✿I accept etsy direct checkout. ✿If you would like me to reserve an item, please convo me with your request. I do expect the reserved item to be purchased within 5 days of listing the item(s). If reserve is not checked out within 5 days of listing, items will be re-listed. ✿CUSTOM/SPECIAL ORDERS and RESERVED LISTINGS: All sales are final, no returns or exchanges are accepted on these types of orders. ✿Please review your address for errors before checking out as I ship to your Etsy address as noted on your purchase invoice. ✿Domestic Orders: I ship by USPS First Class with Delivery Confirmation and Insurance. For orders over $200, I do ship with Signature Confirmation. You have the option to upgrade to Priority or Express Delivery upon check out. ✿International Orders: I ship via USPS First Class International Mail with Insurance when available. THIS SERVICE MAY "NOT" OFFER TRACKING AND MAY TAKE AN UNSPECIFIED TIME TO ARRIVE. INTERNATIONAL PACKAGES CAN TAKE UPWARDS OF "30 BUSINESS DAYS" TO ARRIVE, PLEASE BE PATIENT. OUT OF 1000's OF PACKAGES THAT I HAVE SHIPPED, ONLY A HANDFUL HAVE NOT ARRIVED AT THEIR DESTINATION. ✿INTERNATIONAL CUSTOMERS: For information on import fees, tariffs, taxes, duty fees, etc. you need to contact your countries mail/customs agency. Some countries charge taxes, tariffs, import fees and duty fees before they will deliver your package. THIS IS NOT IN MY CONTROL and I have no way of knowing if there will be a charge and/or for how much this might be. PLEASE DO NOT ASK ME TO MARK PACKAGES AS GIFTS OR TO LOWER THE PRICE OF YOUR ORDER, THIS IS CONSIDERED FRAUD AND IS AGAINST THE LAW. ALL LEGAL AND LEGITIMATE SELLERS ARE REQUIRED TO FOLLOW THESE INTERNATIONAL POSTAL/CUSTOMS LAWS. AS AN INTERNATIONAL BUYER, THIS IS YOUR RESPONSIBILITY. THANK YOU!!! BY MAKING A PURCHASE YOU THEN AGREE TO ALL TERMS AND CONDITIONS: ONCE A PACKAGE HAS BEEN DELIVERED TO THE USPS IT IS NO LONGER IN MY CONTROL AS TO THE TIME OF DELIVERY. THERE SEEMS TO BE AN INCREASE IN STOLEN, LOST AND TAMPERED INTERNATIONAL PACKAGES. CUSTOMS DOES OPEN PACKAGES AT TIMES AND DOES NOT RE-PACKAGE SECURELY WHICH IS BEYOND MY CONTROL. ✿Please contact me prior to sending return. I accept returns up to 14 days after purchase. 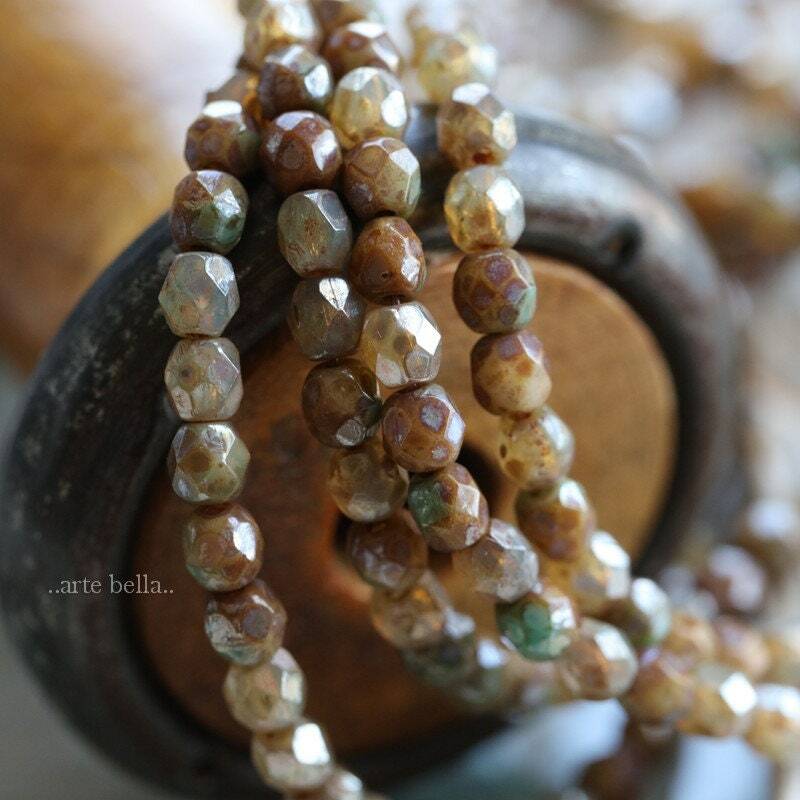 I will refund the bead purchase price minus Etsy listing fees back to your account once I receive the return. You are responsible for the original shipping costs and return shipping fees. Any item returned must be in the same condition at time of shipment and shipped in the same packaging that was sent to you. ✿I take all my pictures in natural sunlight. This can make the beads appear a bit lighter/darker than in person. I do my best to photograph/describe beads as accurately as possible. In no way would I ever misrepresent any items that I sell. 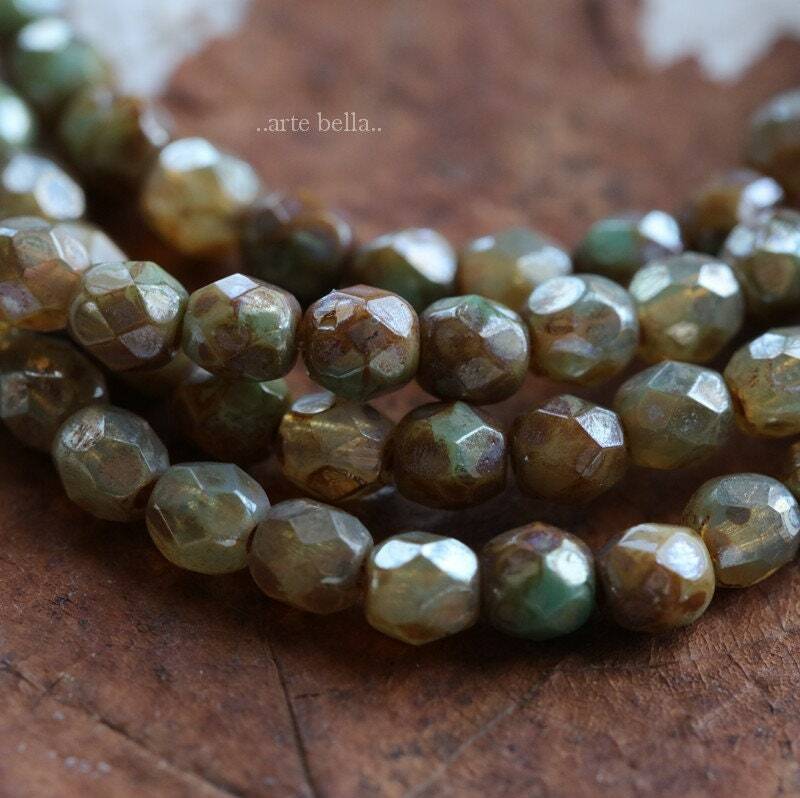 I use a macro lens so you are able to get a closer look at the bead detail and color. I describe the bead colors how I see them. Remember, your monitor settings may be different than mine so please refer to my descriptions. ✿ Please do not use feedback as a way to contact me. Please contact me thru Conversations so I can find a remedy for any problem which may occur. To fulfill your order, you must provide me with certain information (which you authorized Etsy to provide to me), such as your name, email address, postal address, payment information, and the details of the product that you’re ordering. You may also choose to provide me with additional personal information, if you contact me directly. I do not send out newsletters. I personally do not share information with third parties. 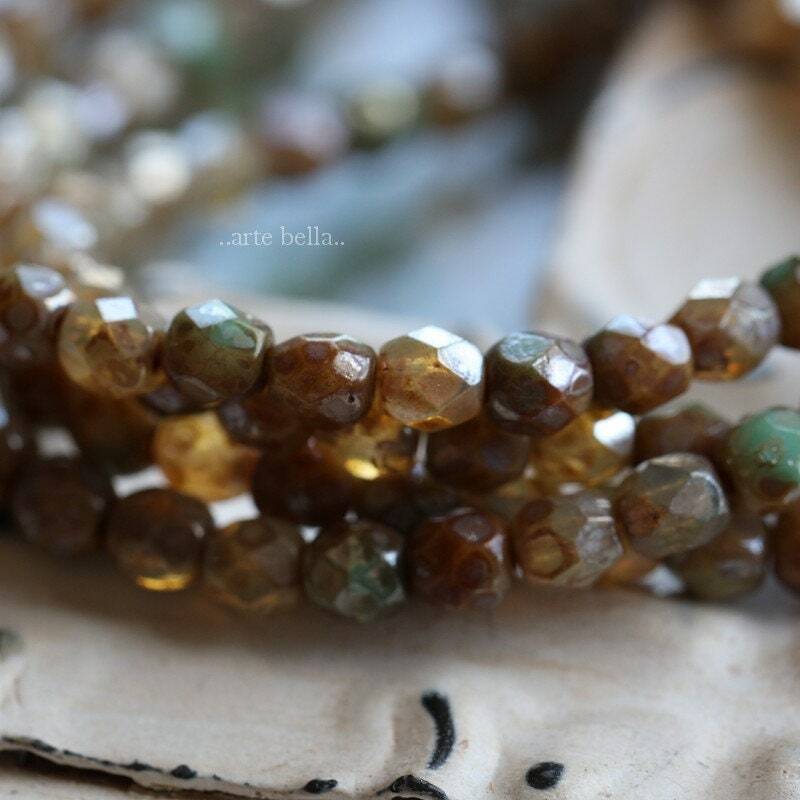 Lovely little tan beads with amber and green turquoise tones. Great quality. Thank you!